A good pie is indeed a wonderful thing (mmm, pastry) so a visit to Reading’s favourite (and only, to be fair) pie shop on a cold, wet January night should be a treat, shouldn’t it? Arriving inside the doorway of Sweeney and Todd’s is a bit like stepping into a butcher’s; the fridge at the front of the shop is filled with giant hams, scotch eggs and pork joints and the fridge behind the counter with a bewildering array of pies, lined up behind their name tags (“hi, I’m your steak and Stilton pie for tonight”). Up a couple of steps into the bar area are a few little booths and then further still the main dining room which was really quite full considering the number of people who seem to pick dieting as their New Year’s resolution. We waited to be directed to a seat and when that didn’t happen we walked past the table of waitresses, ordered a bottle of cabernet sauvignon from the bar and settled into a booth. Not a great start but red wine and a booth sounds lovely, though the reality wasn’t so appealing. Sadly we soon had four or five fruit flies circling round our red wine and the table felt like it wasn’t quite deep enough – we were knee to knee across the table. The wine wasn’t cheap but it tasted like it – a bit rough and earthy, though good enough to wash down a hearty pie, I hoped. The menu at Sweeney’s offers a few things but pies are what they are famous for (the clue’s in the name) which narrowed the field down somewhat. The standard printed pie menu has more than twenty options on it. Added to that there are half a dozen or more seasonal pies. Of course, it is all entirely dependent on what the kitchen has that day so when the one busy waitress finally got round to us we asked her to reel off the list of pies for the night. 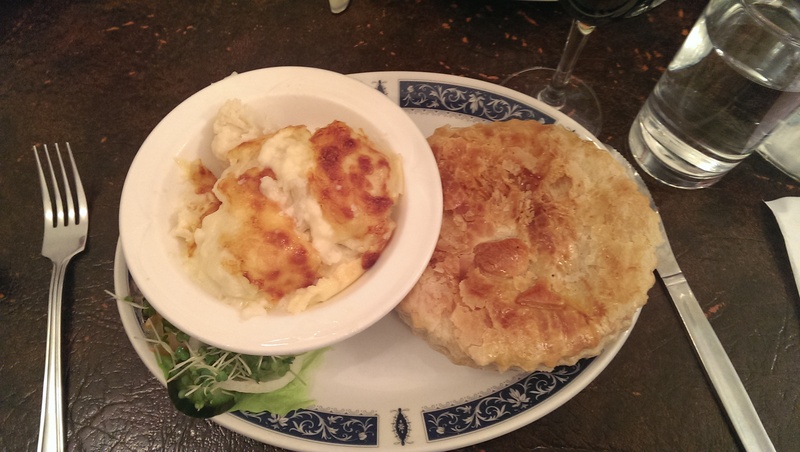 We picked a pie each plus two sides – one each of boiled potatoes and cauliflower cheese (a childhood favourite of mine). “It’ll be fairly quick” she said, as if this was a selling point. I expected the chicken and chorizo pie to be a twist on the standard pie experience and I wasn’t wrong. Perhaps I hadn’t considered it properly but I wasn’t expecting the sauce to be tomato based which just seemed a bit odd. Nevertheless the flavour was good with a touch of jalapeno and a total of three wafer thin slices of chorizo. The chicken wasn’t so great – it was those tiny diced chicken pieces that I associate with catering packs and cheap sandwiches. This wasn’t improved by the fact that there was so little in it: I wasn’t expecting to count my chickens but if I had I would be surprised if I got into double digits. The other pie was venison and wild boar. There wasn’t anything gamey in the taste of the chunks of meat (again, far fewer than there should have been), and it could have been pretty much anything. The gravy was more like hot jelly, adding moisture without flavour. Odder still were the pieces of crinkle cut carrot scattered throughout. Maybe they’d been cut and cooked as part of the pie making process, but I couldn’t help feeling a tin had been involved somewhere along the way. Worst of all was the pastry. I’ve had Sweeney’s pies in the past and taken them home to heat up in the oven and the pastry has been perfect – crisp and buttery on the bottom and light and fluffy on the top. The pies in the restaurant, though, didn’t seem to have been given the same care and attention. It felt like they hadn’t had long enough in the oven, that the oven wasn’t hot enough to crisp them up or that – and I sincerely hope this isn’t true – they had been microwaved. Whatever crime had been committed it meant that the pastry was soggy, sloppy and not enjoyable at all. The sides were equally disappointing. The boiled potatoes were exactly that; five baby potatoes boiled in their skins with no butter, herbs or seasoning of any kind. We added butter from the tiny pats left going soft on the table but it wasn’t enough to make them worth eating. The cauliflower cheese was barely any better. The cauliflower was watery and bland and the cheese sauce was pale and lacking in cheese – the only tasty bit was the bubbled brown layer on top. Both side dishes felt like the restaurant had only provided them because it felt it had to, not because it wanted to. The only potato options available were boiled potatoes or jacket spuds – is it cynical to wonder if that’s because they’re both easy to microwave? For me, a pie should come with mash or chips and neither was on the menu. I shouldn’t neglect to mention the side salad that came with both pies, if you can call it that. Two or three pieces of lettuce, a sprinkling of cress, a single slice of cucumber (in both cases the very dark green bit from right at the end) and a couple of rings of raw onion. No dressing (too fancy, maybe?) at all which suggests that it’s just there to look at. Such a waste for the kitchen to do this at all: it’s a pie restaurant! People don’t expect salad! I’ve written this review with a degree of trepidation. I know that Sweeney’s has legions of fans and I know that many people out there won’t agree with me but I just can’t see the attraction. The total bill for two pies, two sides and a bottle of wine was just shy of forty pounds. Compare that with Pie Minister down the road in Oxford where you get a much better pie with crisp pastry, more meat, more imaginative fillings, a scoop of gorgeous creamy mash, a dollop of mushy peas and some gravy for about eight pounds – the same price as a pie alone in Sweeney’s. If one opened in Reading I can confidently say that I, and probably lots of others, would never eat in Sweeney’s again. Even without one, I can’t see why I would go back. This quirky pub/restaurant/pie shop combination has been a favourite of mine for quite a while but I suspect that its resting on it’s laurels a bit and getting lazy, especially if they’re microwaving the pies and getting stingy with the fillings. I feel it’s a jack of all trades but I still enjoy visiting from time to time. “..resting on it’s laurels a bit and getting lazy..” – exactly right. This place used to be cheap (not any more) and serve delicious pies and sides (not any more). 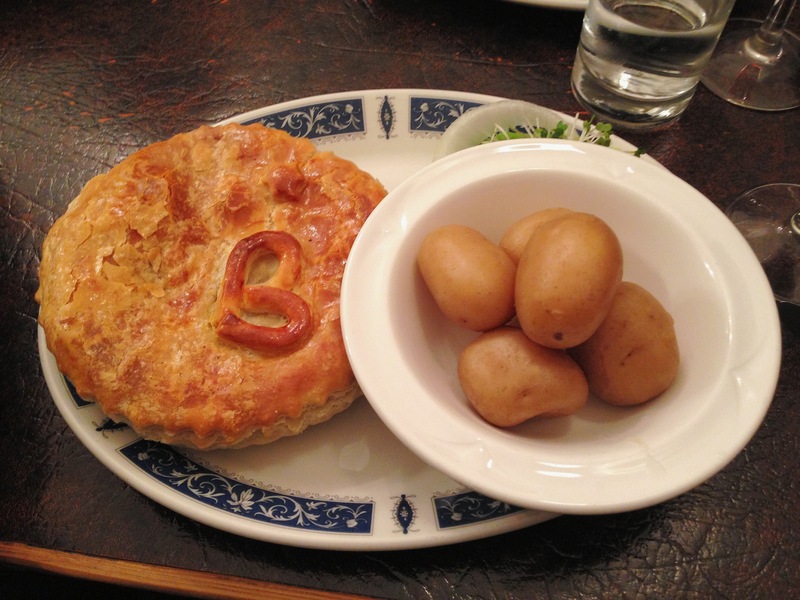 The pies are now all bland – there seems to be no love from the chefs any more. I’ve found the same recently to be honest. When the pies are taken home and heated in the oven they are fantastic, but the experience in the restaurant is not so good. The lady who runs things is lovely and friendly but the rest of the waiting staff are surly and moody and they look odd in the butchers smocks they wear. I go for lunch sometimes and I’m suspicious that the pies are microwaved because they come out in 2 minutes, which is very disappointing considering that they do make all the pastry etc from scratch, why bother cutting corners here?? I so hope they are taking note but if not, why aren’t we all boycotting them? I think “boycott” is a bit strong but I’m sure people vote with their feet by going there if they want to and not going if they don’t. I haven’t visited since I went there to review it and it’s hard to imagine I would again, but that’s just me. Don’t personally agree with a lot of the review, the fillings in the pies I found to be generous and very filling. This is a pie restaurant ar the end of the day, and a family run business that has been around for decades! They make all of the piesnin-house and make around 2000 pies a week! Very admirable in my opinion and a business worth supporting. I only recently discovered this wonderful pie shop and I’ve been back twice, and I’m sure I’ll visit again. I like my fine dining and yet you cannot compare this boutique restaurant to the likes of Heston’s or a larger chain like TGI’s. They do serve chips, the reviewer must have missed that on the menu!